As was said in the famous Alice In Wonderland – “You can learn a lot of things from the flowers.” This is certainly is a reflection on the youngest designer at MIFGS, 13 year old Adeline Dotchin. Adeline wrote in to MIFGS to ask why young people weren’t being represented, and was given an invitation to submit a design. She says that she was inspired by her Mum – award winning landscape designer Ros McCully. 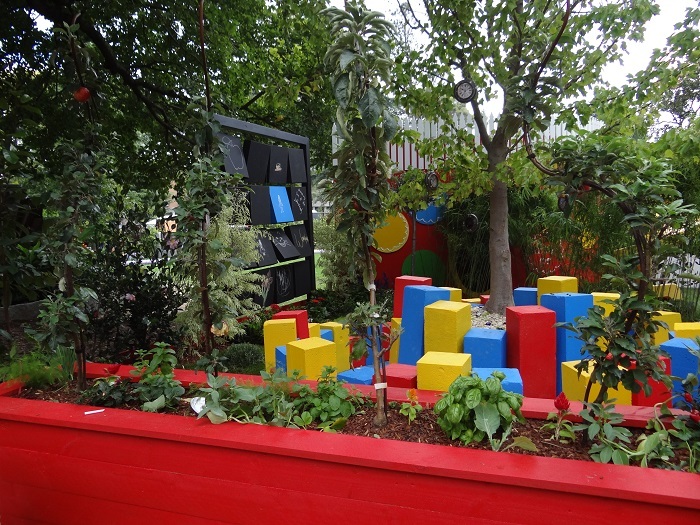 The garden is a magical and whimsical design based on Alice In Wonderland. It features everything kids would ever want – such as chalk-boards, fun play equipment, and a cubby. The colours were bright and fun, as were the sweet decorations such as the teacups, pocket-watches hanging from the trees, and silhouettes of Alice and the Cheshire Cat. My favourite little twist was the white roses that had been splashed with red paint. Other plants included vibrant colored annuals, twisted serpentine apples, rosemary and diosma balls – everything hardy, bright, and kid-friendly. Adeline told me she wasn’t sure whether she’d like to be a landscape designer when she finished school, but it had been a wonderful experience and she had learnt a lot.